Shana Goodwin, 39, is nothing like the woman pictured in the mug shots she shared with ABC News. That woman was arrested more than 100 times for prostitution; her street name was "Shelley Money"; she had a drug problem; and she never seemed to be able to escape the violent men who ran her world. "I was really tired and I was done," Goodwin said. These days, though, she's clean and sober, sitting behind a large desk in the sales department at Thistle Farms, the Nashville, Tenn., company that changed her life. "I could never see this far and that's why it's really important what I do today," Goodwin said. She credits Becca Stevens - the woman who started the company - with showing her the way out. Stevens, 50, is an ordained minister who recruits former prostitutes to make oils, lotions and lip balms that are sold in hundreds of stores across the country. The products are also sold at Whole Foods. Stevens promises the women two years of security and safety if they leave the streets for her residential program Magdalene. Like so many of the women she helps, Stevens said she too was a victim of sexual abuse at an early age. "What I didn't know was that that period would link me to the women on the streets forever," Stevens said. Lemon sage, lavender and honey are all ingredients in the recovery of her women. They attend support group meetings and prayer circles. By the end of the year, the company will have amassed nearly $1 million in sales. Within two years, 75 percent of the women are still off the streets. What makes this work, Stevens said, is that women on the streets desperately need a safe place to sleep and work, and she gives them both. 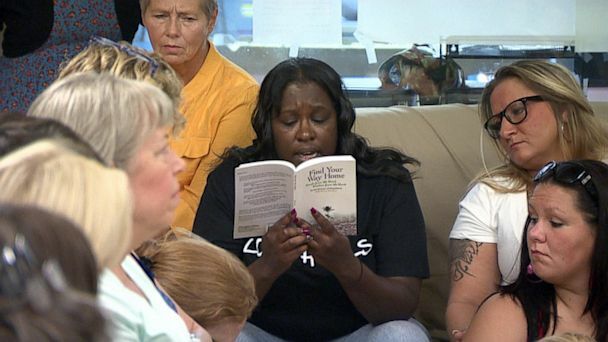 "Sleep is so unsafe for women who have slept under bridges, and who have slept in abandoned houses and trailer parks and all these places where people keep them," Stevens said. But convincing some to change their life isn't always so easy. The women recently discovered that one of their own was back out on the street. She had relapsed. Goodwin said it broke her heart. "Please! Please! Please! This is not what you want," Goodwin told the woman. "This is not meant for you. These people don't love you, we love you. You can come with me and spend the night at my house and sober up." It took a few days, but in the end, the young woman came back home. She remains on the long road to recovery. "I feel like I'm doing healing work - that's in the name of love," Stevens said.